I must be getting old. It seemed everyone in the crowd at this show was about 15 years old. They weren’t checking ID’s, so maybe? Matt Pond PA was the opening band to Jukebox The Ghost, which also made me feel old, because dude’s been around forever! I came in to the last two songs of his set. His voice is crystal clear, and pitch perfect. Matt Pond PA has been around since 1998, and has cranked out 8 LPs and 8 EPs, it was a little bit confusing to see him opening for a newbie on the scene like Jukebox the Ghost, but since both bands emerged originally from Philadelphia, it could be that they’re buds. Both immensely talented bands. Matt Pond finished off with his new single Love to get Used, which certainly sounds like a bitter break up song, with lyrics like “let’s hang on to abandon,” and “I give my love to get used,” Pond sings it with such a lullaby inspiring voice that it sounds like you could place it in a vintage Disney cartoon like Sleeping Beauty, with the cartoon animals fluttering around. 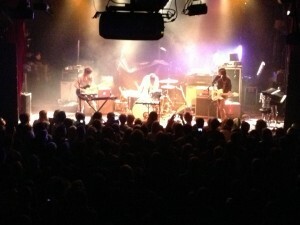 I previously wrote about how surprised I was by the insane talent this band boasts. Their live show is interactive, fun, and full of cabaret style musicals and power-pop ballads, and each song showcased the bands talent, each member getting their own respective solos, in pretty much every track played. Already with a cult following in Toronto, their first headlining tour throughout Canada, wasn’t sold out, but the front was packed full with youngsters (as I see them), fist-pumping and singing along. 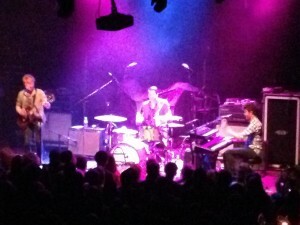 A three-piece, Jukebox the Ghost’s sound is so big you would expect to see five or six members on stage. 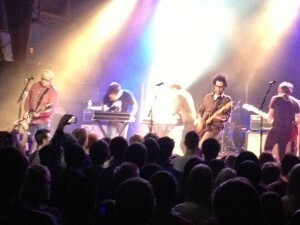 Prior to 2012, most of JTG’s songs had thematically revolved around sci-fi, however, with the release of Safe Travels, however, the band focused on writing more personal lyrics, inspired by actual life happenings. You can notice a difference as they become more involved in tracks played off of Safe Travels, as do the fans, who love relating to lyrics about life and love (I prefer the science fiction spin on things). Either way, this band has the talent, stage presence and writing skills to create a long and large venue headlining career. If Jukebox the Ghost is good at one thing (besides constantly touring, endearing themselves to audiences everywhere, and staying under 300 collective pounds) it’s capturing millenials’ angst in upbeat three-to-four minutes songs. Their new single, “Don’t Let Me fall Behind,” is just another example of that skill. The trio puts together their classic keyboard, guitar and drums combination to create a beautiful song that articulates everything us 25-35 year old worry about: love, loss, the fear of missing out (FOMO), and the quest for that perfect someone. Every time this band puts out a song I am newly convinced they are singing especially to me. I’m sure the majority of their growing base of fans has the same conviction, which makes me confident this up-and-coming band is actually far from falling behind. It was a re-living of highschool angst all over again! Recently making their debut on Late Night with Jimmy Fallon, this trio from Minneapolis has been around and kicking since 2003, forming in high school. Now, now recently signed with Chris Walla from Death Cab’s record label have toured with the Naked and Famous and now with Motion City. These girls and guy play heavy classic indie rock, the soft lilting voice a nice contrast to the sometimes strangling guitar sounds. Cacie Dalager’s voice stands out above the sounds clear and concise. The music is reminiscent of early 00’s indie, think Death Cab, Rainer Maria, etc. I can see them soon heading out on their own headlining tour. Where do I start with these guys? They stole the show completely. Extreme dance power pop with extremely talented musicians. 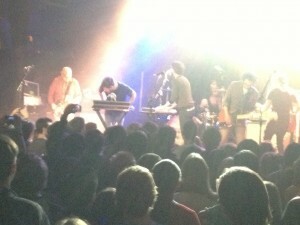 Stage presence that suggests a band comfortable in their skin that has been touring for years. these guys are embarking on their first Canadian headlining tour in February and March. I highly suggest seeing them. A seemingly classically trained pianist, a drummer with a penchant for tossing his right handed stick in the air as his parlor trick between his fast beats and a guitarist that can shred in the middle of a dance song. These guys were so much fun the crowd was screaming and cheering as if they were the headliners. Near the end of their set they declared “we’re kind of known for performing bad covers, if you don’t know this one, go back in time and learn it” (I’m paraphrasing of course, because who remembers quotes that aren’t from Arrested Development from more than two days ago?) They then proceeded to enter into Whitney Houston’s “I Wanna Dance With Somebody (Who Loves Me)” and I sang along with the fellow old timers. Jukebox The Ghost‘s newest album is called Safe Travels, and I wish them just that, because they’re going to be gone for a quite a while I suspect. Nine years ago I saw these guys in Toronto at the Phoenix It was my own smack in the face of “woah, you’ve aged.” Justin Pierre, the lead vocalist of Motion City, may be nine years older, however his voice is as strong as ever. This guy has serious range. They’ve just released their fifth studio album and were finishing their tour in Toronto. Extremely nice these guys hang around after every show meeting their fans. I’ve been told the singer to preserve his voice doesn’t speak to his fans but just karate chops, mimes and takes pictures, which almost seems more interesting than conversing. Their fans are so loyal – it’s refreshing to see Torontonians finally reacting at a concert rather than standing around like they’re all Daria. Crowd surfing, collective jumping, moshing, singing the words to every song, it was a breath of fresh air. Their encore consisted of a Ben Folds Five song (which my friend went insane for as it combined his two favorite bands) and their best known song, the always truthful ‘The Future Freaks Me Out‘ in which a giant collective sing-a-long erupted and at the line “what’s up with Will and Grace,” I wondered if the young’uns in the audience understood the line or just dug the song.. The future really does freak me out. There are some things that just defy the limits of understanding of the mind: the boundless enormity of the universe, the diversity of life at the bottom of the ocean, the quantity of atoms that make up the entirety of the galaxy, and, most mind-bogglingly shocking of all, the fact that I can get my hands on a pair of Jukebox the Ghost tickets without literally, physically fighting somebody for them. Whenever Jukebox rolls into town I’m sure this will be the time that every other living soul in Chicago comes to the realization that this band is the best thing since sliced bread (arguably better – who doesn’t love a good dinner roll?) and there will be riots in the streets when tickets are released. Yet somehow, every time tickets go on sale, all I have to do is click that buy button and they’re mine – In.con.ceivable. And yes, in this instance, that word means exactly what I think it means. Jukebox the Ghost took the stage the way they always do – with understated good nature, smiling, waving and calling back to their fans’ cheers. There might not be riots and tear gas when tickets are released, but their fan base does appear to be growing (in terms of quantity as well as height, I swear there wasn’t a man under 6 feet in that place), and the venue was chock full of happy fans wiggling in anticipation of yet another amazing show. They weren’t disappointed. The band started out with ‘Adulthood’, one of my favorites off of their new album ‘Safe Travels’ which was released late last month, and which half of the crowd had already bought and memorized (no shame 2012 – myself included). They also worked their way through classics such as “Victoria” “Schizophrenia” “Good Day” and their signature song “Hold it in.” There simply isn’t a song that this band plays that I dislike – slow, fast, bubbly, angry, dark, light, intense, soft, it doesn’t matter. They bring their distinctive Jukebox tint to everything they do, and with pianist Ben’s soaring falsetto, guitarist Tommy’s powerful riffs and always amusing facial expressions, and drummer Jesse’s “just happy to be here” smile and solid beat they can do no wrong. Billboard recently did a piece on the band in which their manager is quoted as saying “these guys are honestly the hardest working band I know.” I believe it – Jukebox has come through Chicago on tour six separate times since I moved here two years ago. If they come through your part of town, go see them only if you can deal with so much happiness your head might explode. But if you’re in Chicago and you take the last ticket before I get mine, be warned that it will be on.